Thanks for dropping by. We're going to visit the Hudson Valley. 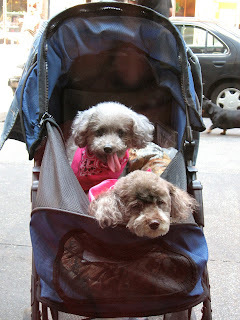 These "babies" were waiting outside of Lassen & Hennigs on Montague Street Saturday. That Brooklyn Astroturf is Hot! According to AccuWeather, Saturday's high was 86 degrees, though the humidity made it feel like it was in the 90s. 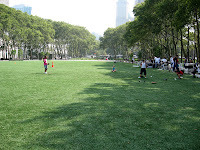 McBrooklyn decided it would be a perfect day to check out the reports that synthetic turf gets much hotter than the ambient temperature, so we grabbed our wall thermometer and trotted over to Cadman Plaza Park, recently covered with plastic grass. 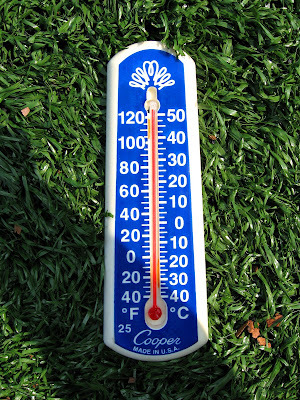 Wow, were we surprised to see the temperature of the synthetic turf -- higher than 125 degrees! The Park is lovely, but that "Field Turf" is HOT! Fifth Avenue Committee and the tenants of 533 Bergen Street (near 6th Avenue) will be hosting a neighborhood rally and block party on Sunday, August 26, at noon to protest the attempted “owner-use” evictions of four rent-stabilized families. According to the Independent Media Center, the owners are both "well-recognized designers and artists (one was recently named one of '20 under 30' to watch by Print magazine and one of “The best people of 2004” by Time Magazine)." The plan, according to The Brooklyn Rail, is to convert two-and-a-half floors—3,000 square feet—into one, multi-tiered apartment. Eviction proceedings have already begun. 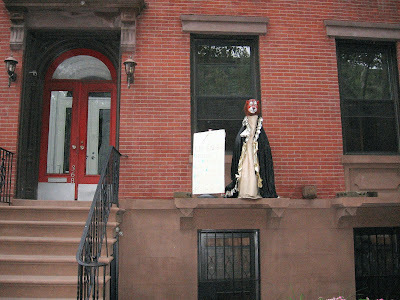 As seen on Middagh Street in Brooklyn Heights. 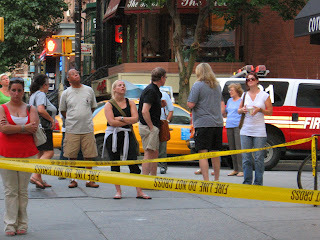 - The Brooklyn Heights Blog has a photo (by Kurt Dietrich) of last night's car fire on the Brooklyn Bridge. - Drivers: there's a very nasty BQE on-ramp, the one for west-bound traffic just north of Congress Street. 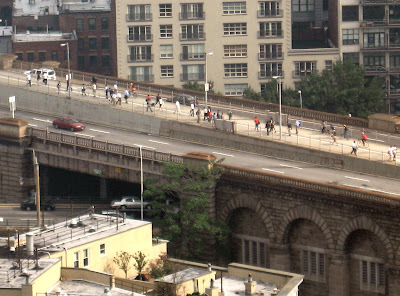 The BQE Watch blog says: "Frequently there are ambulances, police cars, and, worst of all, distraught people emerging from automobiles." 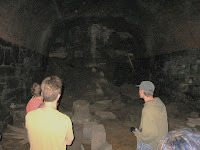 Check out the photos and map here. There will actually be a press conference about them on Friday, August 24 at 12:30 p.m. at Borough Hall. Everybody will be there. At least, everybody still in town, which means the staff at the Starbucks on Court Street, the Brooklyn Cyclones, and Channel 12. 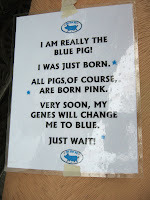 "I really am the Blue Pig! I was just born. All pigs, of course, are born pink. Very soon, my genes will change me to blue. Just wait!" We are crossing our fingers, and waiting. 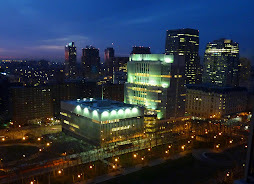 Brooklyn in Brief -- Thursday P.M.
- NYU students are moving into the "Sliver Building" at 67 Livingston Street in Brooklyn Heights, says the Brooklyn Eagle, and the Heights Association has no problem with that. But the executive director of the Greenwich Village Society for Historic Preservation urges local groups to "engage NYU to ensure the process contributes to the quality of life there." Supporters of Brooklyn's Khalil Gibran International Academy -- the first Arabic dual language school in NYC -- have gotten a bit fed up with all the right-wing hysteria directed against their fledgling school. Monday evening they held a rally in support of the school, and in particular, in support of Principal Debbie Almontaser, forced out because she didn't denounce a women's group's T-shirts. 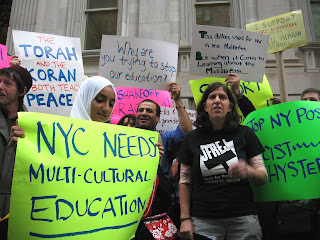 Interestingly, one of the speakers, Rabbi Michael Feinberg, mentioned that the school’s principal opposition group, the Stop the Madrassa organization, is backed by three extremist right-wing organizations: the Gathering of Eagles; NY-ICE (New Yorkers for Immigration Control and Enforcement); and The United American Committee. 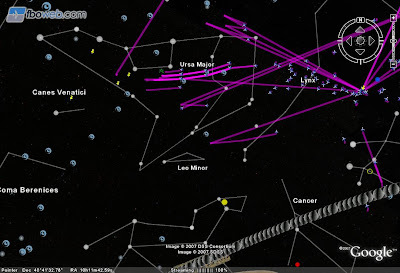 If you could actually see stars over Brooklyn tonight, this is what you'd see, courtesy of Google Earth's new product Google Earth 4.2. (That's the Moon traversing the lower right corner.) There are many viewing options, including layers of information you can opt in or out of. If you click your mouse on the blue circles like those on the bottom left, you'll see the Hubble telescope's view of those galaxies. "Blogger and Blog*Spot are unavailable right now. We apologize for this interruption in service. Blogger is undergoing brief maintenance and will return in a few minutes." There will be quite a handful of Senator Barack Obama fans to see their candidate at the Brooklyn Marriott tonight -- the event (hosted by Brooklyn for Barack together with Obama for America) is SOLD OUT. This is the Senator's first large scale community event in Brooklyn. - Verison has been pimping its Brooklyn FiOS service, which offers "super fast surfing." But when we entered a Brooklyn Heights phone number, we got a "Verizon FiOS Internet Service is not currently available for your address" response. - Whatever they say about her new husband, none of it matters to Denise Miller. The 43-year-old secretary at a major Manhattan firm had readily accepted a marriage proposal from Jeffrey Miller, 35, who’d recently been charged with murdering his ex-girlfriend, reports the Brooklyn Eagle. “He’s a wonderful man,” she said of Judge D'Emic, who's trying the case. 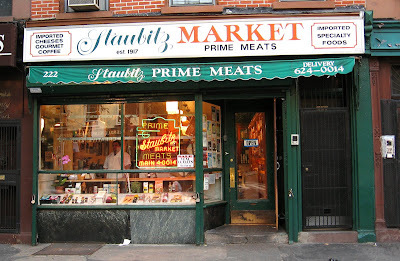 Ninety years plus with only three owners, Staubitz Market at 222 Court Street in Cobble Hill has changed very little over the generations. John McFadden and his son John McFadden, Jr. now run the shop. John Sr. has been there more than 50 years. He remembers when Osso Bucco used to be 29 cents a pound. 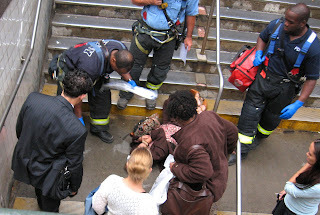 This woman (face obscured) slipped on the subway steps at MetroTech after work today. About four people called 911, and someone ran and got some paper towels to put under her head. She laid on the wet ground groaning for about eight minutes until police, fire and EMS arrived. The steps were pretty slick from the rain; she was wearing backless heels. 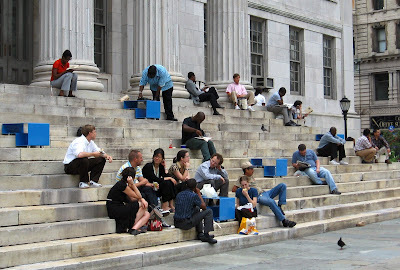 Notice the boxy blue things on the steps of Borough Hall? Artist Mark A. Reigelman II created these "Stair Squares" as both a "functional and an aesthetic work," says the Cleveland Institute of Art. The blue thingies are made of steel and are firmly affixed. "This project not only crosses the boundaries of design and art, but raises questions concerning the respective function of aesthetics as an organizing principle within public spaces and as a way to facilitate, within the framework of daily life, various forms of social, economic and leisurely interactions," said Saul Ostrow, chair of the Institute's visual arts and technologies environment. Okay. And they're handy when you eat lunch, too. 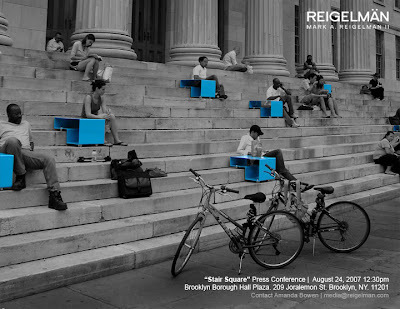 The "Squares" will be on display from August 17-26. Satisfy your sweet tooth today (Tuesday at 12:30 p.m. and 8:30 p.m.) as Brooklyn Community Access Television (BCAT) traverses the borough for the ultimate sweet spots. You’ll sample goodies at One Girl Cookie in Boerum Hill; learn how to assemble a triple berry butter crème cake with Shannon Pridgen of Heavenly Crumbs in Bed-Stuy; witness the making of organic baked goods at Cheeks Bakery in Williamsburg; visit Bay Ridge for tasty treats at the Little Cupcake Shop and experience the creation of an original Brooklyn egg cream at Anopoli. The City giveth and the City taketh: After a valiant struggle on the part of homeowners (see all the posts listed below), the Department of Housing Preservation and Development ruled Monday that the city should use its powers of eminent domain to seize 21 properties on three blocks in Downtown Brooklyn, plus a financial services firm that employs 150 people, reports the Brooklyn Eagle. 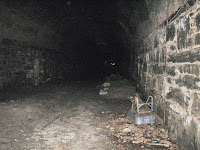 Several of these properties are thought to have been part of the historical Underground Railroad. Weirdly, this comes on top of an announcement this week of the city's plan to spend $2 million to commemorate abolitionist activity in Downtown Brooklyn. Except that the actual spots where the abolitionist activity took place are, uh, about to be razed. Is $500,000 Underground Railroad Study Bogus? 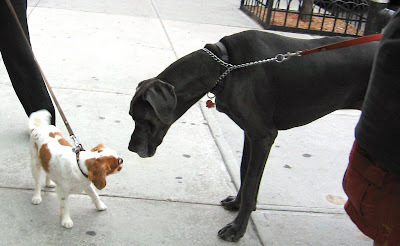 Researchers say that all dogs -- like these two on Court Street in Brooklyn Heights -- are brothers under the skin. The Great Dane's owner says that he's just a big wuss. The Vertical Player Repertory will be performing Puccini's "Il Tabarro" using the Mary A. Whalen as their stage on Friday, September 07, through Sunday, September 16. VPR is collaborating with PortSide New York to present this "steamy maritime opera about adultery and murder." The Mary A. Whalen is a retired oil tanker docked at the Red Hook Marine Terminal. "With actual stevedores and professional opera singers sharing the stage, surrounded by views of gantry cranes, containers, the lumber port, passing vessel traffic and a spectacular view of Governor's Island and the lower Manhattan skyline, this will be an unforgettable on-site experience for audience and performers alike." The event is hosted by American Stevedoring Inc., operator of the Red Hook container port. 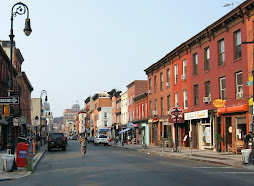 CORD has sent us the word that Councilman Bill De Blasio has announced there will be a town hall meeting to discuss the 360 Smith Street problem* this Thursday night, August 23, at Buddy Scotto's funeral parlor on the corner of Court Street and First Place in Carroll Gardens. *For those not following the story, a much-derided 70-foot-tall Scarano building has been proposed at the corner of Smith Street and 2nd Place. Smith Street: Zombies? 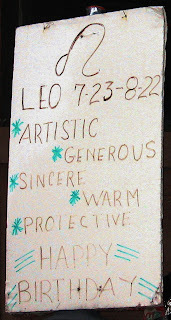 Performance Art? - Gridskipper checks out the eats on Henry Street. 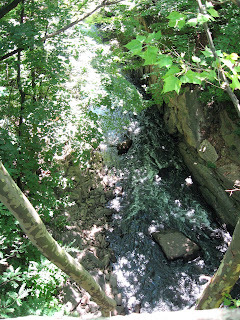 - DumboNYC offers food and wine tidbits. 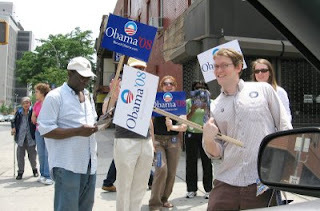 - Brklynstories links to Utne Reader's blunt truth about soy: eating too much can be bad, very bad. 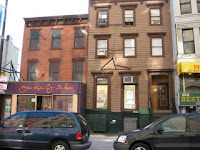 - Brooklyn Skeptic reviews Brooklyn's bars. - Plate of the Day talks about jerked chicken. 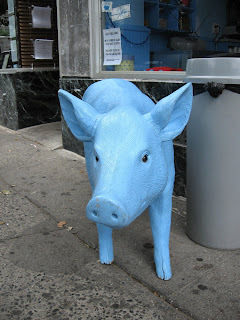 We were taken aback yesterday by the change in color scheme at the Blue Pig ice cream parlor on Henry Street in Brooklyn Heights. 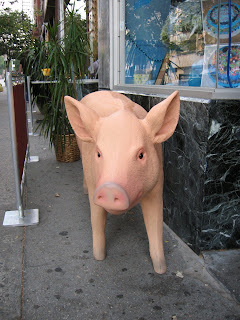 The blue pig was gone -- only to be replaced by a pink porker. See the Before (left) and After photos below. 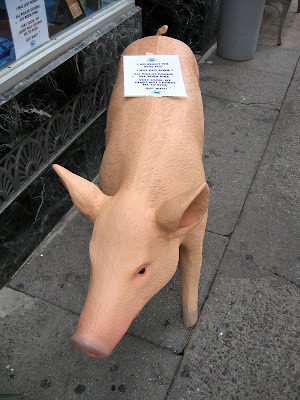 The salesperson at the store kept insisting the pig was blue, but we weren't fooled. He Might Be Crazy -- But Wouldn't You Love to Take the Trolley in Brooklyn? Brooklyn's authentic trolley aficionado Bob Diamond, discoverer of the Atlantic Avenue train tunnel (see McBrooklyn's photos and video of the awesome underground tour here) wants to get Brooklyn's trolleys running again through the famous tunnel under Atlantic Avenue, as shown below, from the waterfront to Boerum Place. Mr. Diamond has suffered numerous setbacks. The trolley cars stacked up behind Fairway in Red Hook (photo, above) are left-overs from a previous trolley attempt of Diamond's that came just a little too early in Brooklyn's redevelopment. 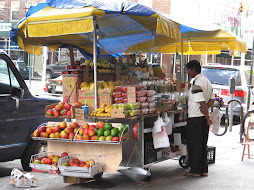 The powers that be don't appear to be jumping on the concept of real, live trolleys (not those buses painted to look like trolleys) running a loop from, say, Jay Street/Borough Hall, along Atlantic to Brooklyn Bridge Park. According to a recent article in the Daily News, officials say shuttle buses to the park have worked just fine. But there's something that doesn't want a dream to die. Okay, he might be crazy -- but wouldn't it be fun to take a real trolley in Brooklyn? 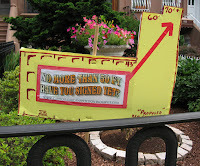 See Diamond's Brooklyn Historic Railway Association web site. 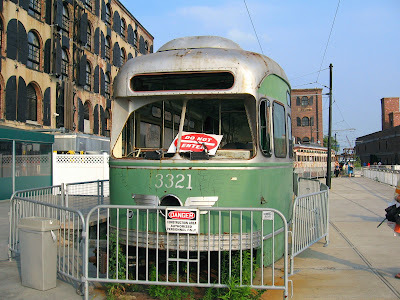 See Forgotten-NY Trolleys, Diamond in the Rough, for a tiny glimpse of the history behind Diamond's trolley adventures. 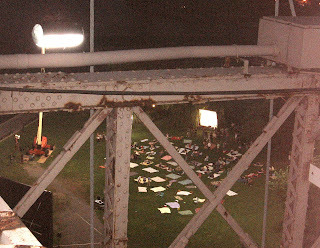 DumboNYC put out the word that anyone could drop by last night to be an extra at the shoot for "How to Lose Friends & Alienate People," being filmed under huge floating lights at Empire-Fulton Ferry State Park, seen here from the Brooklyn Bridge. So hundreds did drop by -- the tent in the Empire Stores was packed and many people brought blankets and picnic baskets. 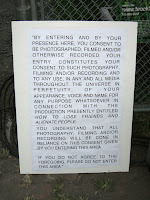 Signs warned participants that they gave up the rights to their image forever and throughout the universe. The local extras were in a scene with Simon Pegg (”Shaun of the Dead,” “Hot Fuzz”) and Kirsten Dunst (”Spiderman I, II, III,” “Eternal Sunshine of the Spotless Mind.”) More details about the film at DumboNYC. 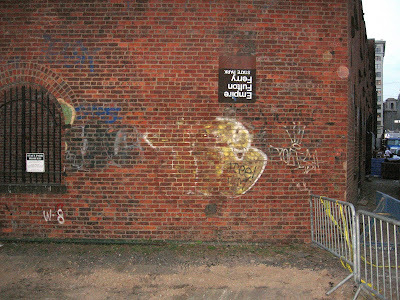 Another Dumbo Riddle: What's Wrong with This Picture? McBrooklyn just discovered this nifty little site called Walk Score, which helps homebuyers and real estate agents find houses and apartments in "walkable" neighborhoods. You type in an address and Walk Score shows you a map of what's nearby (restaurants, bars, parks, hardware stores), calculating a Walk Score for any property. Walk Score makes the point that buying a house in a walkable neighborhood is good for your health and good for the environment. No, nothing as mundane as a jilted bride. In Cobble Hill, residents boost full-size, royally-garbed lions up onto the ledge, as these Leo-lovers at 368 Clinton Street have done. Schools Chancellor Joel I. Klein announced Monday the appointment of Danielle Salzberg as interim acting principal of Khalil Gibran International Academy in Boerum Hill, the first Arabic-themed school in New York City, according to the Brooklyn Eagle. The school’s original principal and a main founder, Debbie Almontaser (who is Arabic) turned in her resignation Friday after appearing to support a group that printed up "Intifada NYC" T-shirts. Conservative web sites and right-leaning newspapers (the New York Sun and now the Post), along with a group calling itself "Stop the Madrassa" and Assemblyman Dov Hikind have been calling on the Department of Education to shut the school down. The appointment of a Jewish principal could be a brilliant move on Klein's part. According to the DOE, Salzberg has been working with the school all along, and according to the Eagle story, the Arab-American Family Support Center fully supports Ms. Salzberg. The Post's Andrea Peyser says, however, "This might be the worst joke ever to hit Brooklyn." The Sky is Falling on Montague Street! 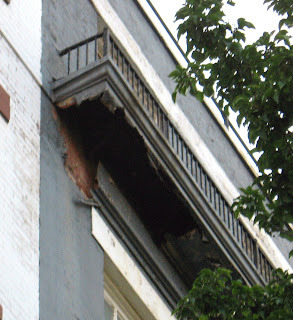 The underside of a balcony hanging high over the Haagen-Daazs on Montague Street near Henry Street in Brooklyn Heights just plain fell off Monday early evening. A bit of it landed on the sidewalk right next to the bench outside Haagen-Dazs; the rest got stuck in a tree. Luckily, no one was hit. 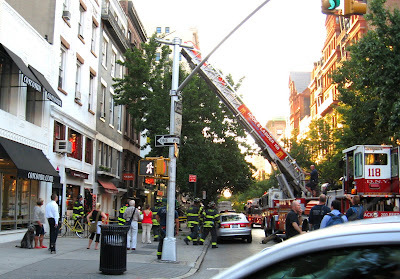 The fire department had to send a man up the long ladder (above) to knock the debris from the tree before it fell on somebody. The gathering crowd was quite concerned that Haagen-Dazs would be closed for the rest of the night, but the swift action of the fire department made that unlikely. New Yorkers are living longer than ever, even if you factor out declining deaths from homicide, AIDS, and overdose. Could it be the rich social and cultural scene? The spillover effect from so many rich folks? The influx of the young and the restless? Or is it because the whole city is actually one massive exercise machine? Photo by Said&Done, Creative Commons license. 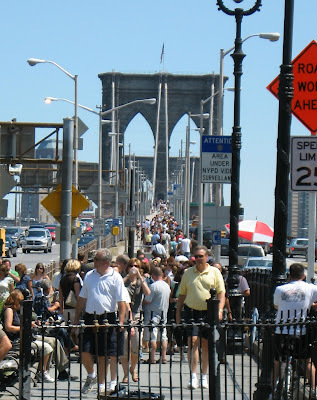 New York police set up radiological monitoring and vehicle checkpoints Friday and Saturday in response to the rumor of a terrorist threat published on an Israeli web site, but locals and tourists alike were out in force during the beautiful weekend weather. By the end of the day Saturday, the extra security measures were being gradually relaxed after New York police said the threat could not be substantiated. 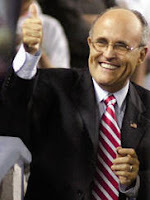 The Rudy Giuliani Presidential Committee will be throwing a "Rally with Rudy in Brooklyn" on Monday, August 13 at Congregation Shaare Zion, 2030 Ocean Parkway (between Avenues T and U) at 7 p.m. $40/person. Discount to members of the Brooklyn Museum and Families First (hahahaha only joking!). To celebrate their 4th anniversary, on August 11th and 12th (Saturday and Sunday) they're hosting a two-day outdoor festival. This will feature a whole host of bands including Gang Gang Dance, Psychic Ills, Artanker Convoy, Samara Lubelski, TK Webb and Electroputas. Many new signings to The Social Registry will be performing such as Growing, UK-based Sian Alice Group (playing their first ever US show), Mike Bones, Christy & Emily and Douglas Armour (his East Coast debut). Special surprise -- a reunion show from Ghost Exits, their first live performance in about three years. Hard copy tickets are available at Other Music and Eat Records. - Craigslist is holding a "boot camp" for non-profits and social entrepreneurs at BAM. 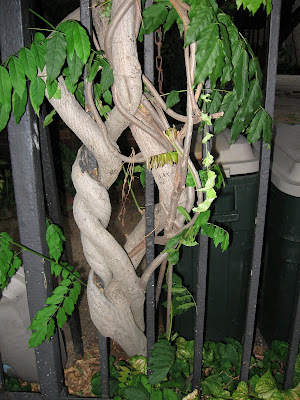 - The Kensington blog is compiling a list of trees blown away by the tornado. Respond before the city moves on to the next crisis. You know that there's at least one sport you can do: Rock, Paper, Scissors. On Saturday, September 1st, the Brooklyn Cyclones will hold a "Rock, Paper, Scissors" tournament, with a grand prize of two 2008 Cyclones' season tickets and two round-trip JetBlue domestic airline tickets. The Rock, Paper, Scissors tourney will take place on the field at KeySpan Park, with four finalists advancing to the Cyclones' RPS Final Four, to be held during that night's game against the Staten Island Yankees. In the end, it wasn't the raging anti-Arab mobs that brought an end to the budding career of the Khalil Gibran school's founder Debbie Almontaser, nor was it the inept site search by the Department of Education. It was some T-shirts printed by an Arabic women's group with the words "Intifada NYC" that ended the tenure of the first principal of the first Arabic-themed school in NYC, which will open in Boerum Hill in September, reports the New York Post and the Brooklyn Eagle. Though the T-shirts had nothing to do with Ms. Almontaser or the school, the group operated out of the same offices used by an organization Almontaser works with. Ms. Almontaser initially defended the women's use of the word "intifada." Though she later reconsidered, that (as they say) was that. - Arabic-themed school finds a home here. - DOE to 'cram' Arabic-themed school into Park Slope elementary school here. 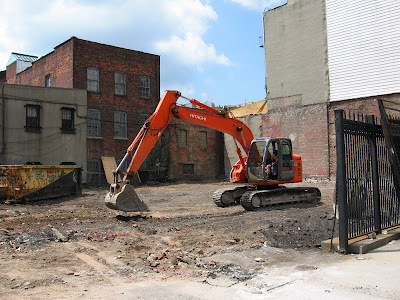 On July 23, we posted "Say Goodbye to 182 Atlantic Avenue." The site (on Atlantic near Court Street, behind the old Independence Bank building) was recently the home to the highly commendable Independence Community Foundation (the small picture on the left), but it passed into the hands of Two Trees Management on July 25. Well, we were busy and forgot to check in during the intervening two weeks. But we weren't surprised Thursday afternoon to find that 182 was kaput, because a source had told us that Two Trees was champing at the bit to knock the sucker down. 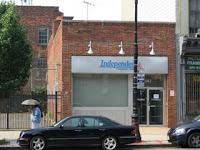 Independence Community Foundation has moved to 45 Main Street, a Two Trees property experiencing a bit of trouble recently. Now that 182 Atlantic is torn down, construction will begin on the 37-unit, six story apartment building (photo here) that Two Trees is putting up behind the bank building -- which, by the way, is the future home to Trader Joe's. 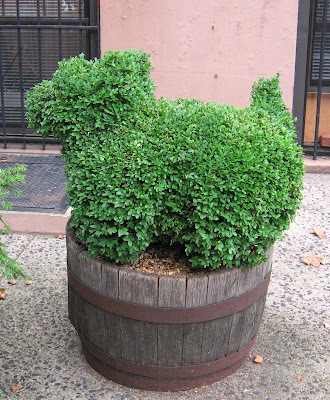 How Much Is That Doggie in the Planter? This imaginative bit of topiary on Henry Street near Degraw looks like it's ready to jump out of the planter while waggling its little tail. Using Google Maps, we tracked the path of the tornado as it cut it's way through Brooklyn. According to the Brooklyn Eagle, the twister was believed to have started at 74th Street and Shore Road (green tag) before moving northeast to 68th Street and Fourth Avenue, then to Lief Ericson Park, up Sixth Avenue and 58th before swinging out to Midwood along Caton Avenue (red tag) , where it died down. The National Weather Service confirmed that Wednesday's storm was an EF2-class tornado, winds up to 135 miles-per-hour, causing serious damage to homes in Bay Ridge and other sections of Brooklyn. Early estimates by state Sen. Marty Golden’s office put damages possibly in the tens of millions of dollars. According to the Eagle, Lief Ericson Park lost between 30 and 40 percent of its trees. Roughly 400 roofs had been damaged, some ripped clean off. UPDATE: Another map from the National Weather Service vis the Brooklyn Eagle here. The steady trickle of business-suited pedestrians over the Brooklyn Bridge continued as of 10:30 this morning as most of the mass-transit options into Manhattan remain flooded following last night's massive storm. Here is the MTA's Service Alert Page. The official dedication of the Pearl Street Triangle in Dumbo has been postponed (DumboNYC). UPDATE: Travelers report it is taking hours to get from Manhattan to Brooklyn, with the transit system in a state of chaos. One commuter says he started at 81st Street at 9:30 a.m. and had to take a patchword of trains and buses -- including a freelance non-MTA bus where the driver pocketed the $2 -- only to arrive in Brooklyn Heights at 12:45. 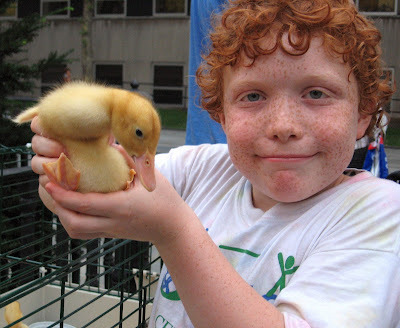 Ducklings, hens, baby goats, pigs and sheep were some of the attractions that kept kids and their parents oohing and ahhing at the 84th Precinct's Night Out Against Crime last night at Borough Hall. The Gowanus Wildcats Drill Team, wearing bright red, did their drill thing; 84th Precinct Explorer Scouts handed out brochures; faces were painted and kids got pony rides. 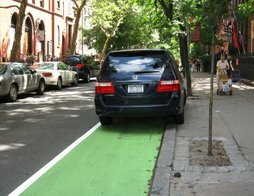 Where Does Brooklyn Stand on Congestion Pricing? Brooklyn in Brief, Monday a.m.